How do populations grow? How do viruses spread? What is the trajectory of a glider? Many real-life problems can be described and solved by mathematical models. In this course, you will form a team with another student and work in a project to solve a real-life problem. You will learn to analyze your chosen problem, formulate it as a mathematical model (containing ordinary differential equations), solve the equations in the model, and validate your results. You will learn how to implement Euler’s method in a Python program. If needed, you can refine or improve your model, based on your first results. Finally, you will learn how to report your findings in a scientific way. This course is mainly aimed at Bachelor students from Mathematics, Engineering and Science disciplines. However it will suit anyone who would like to learn how mathematical modeling can solve real-world problems. To follow the process of the mathematical modeling cycle. Formulate and specify a real-life problem. Construct appropriate ordinary differential equations with relevant parameters and conditions. Solve the ordinary differential equations and implement Euler’s method in a (Python) program. Validate the results of the calculation. Write a scientific report in LaTeX about the mathematical model you construct. 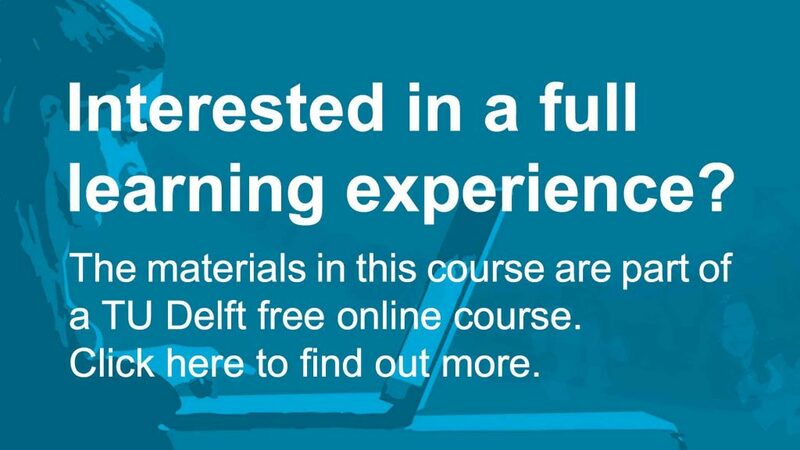 Mathematical Modeling Basics by TU Delft OpenCourseWare is licensed under a Creative Commons Attribution-NonCommercial-ShareAlike 4.0 International License. Based on a work at https://online-learning.tudelft.nl/courses/mathematical-modeling-basics/.